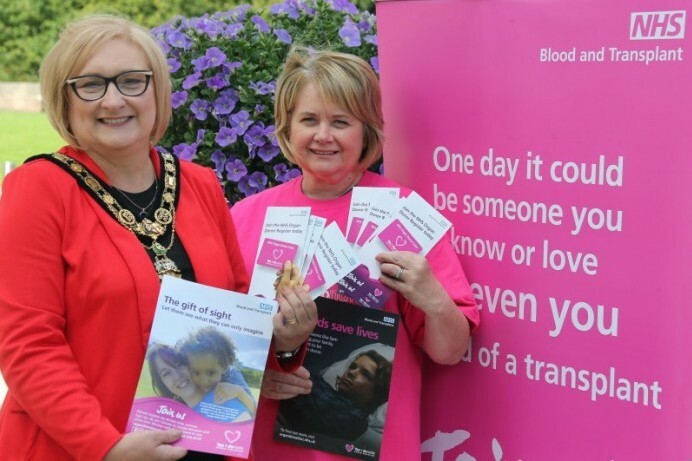 Causeway Coast and Glens Borough Council is using light to help save lives by turning its civic headquarters pink in support of Organ Donation Week. The awareness campaign begins on Monday 3rd September. In Northern Ireland there are approximately 135 people on the transplant list and every year around 15 people die while waiting for a life-saving operation. One donation can save the lives of up to eight people. During Organ Donation Week, it is hoped that more people will talk about organ donation with their loved ones. Mary McAfee, Organ Donation Specialist Nurse at the Causeway Hospital said: “It’s fantastic to see Causeway Coast and Glens Borough Council actively showing its support for Organ Donation Week in this way. We want people to talk to their families and realise that words save lives. Knowing what a loved one wants is hugely important when families are faced with making decisions at what are very difficult times. To find out more about organ donation and how to sign the register go to www.organdonationni.info. Showing their support for Organ Donation Week are the Mayor of Causeway Coast and Glens Borough Council, Councillor Brenda Chivers and Mary McAfee, Organ Donation Specialist Nurse at the Causeway Hospital in Coleraine.